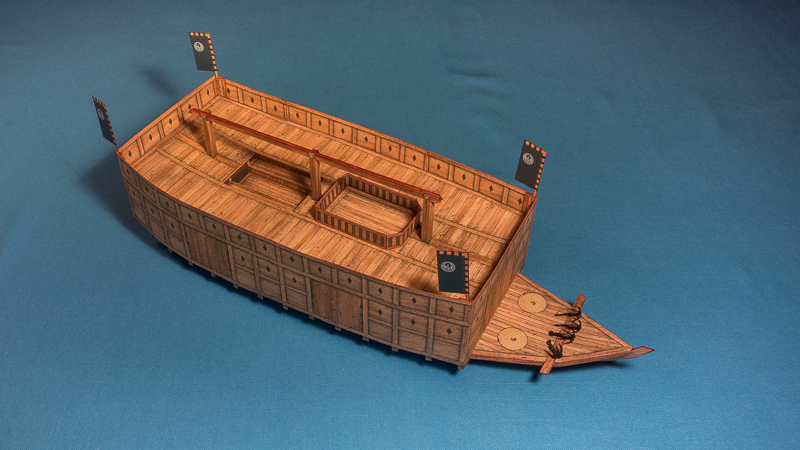 This is the finished build of the sekibune paper model in rowing configuration. 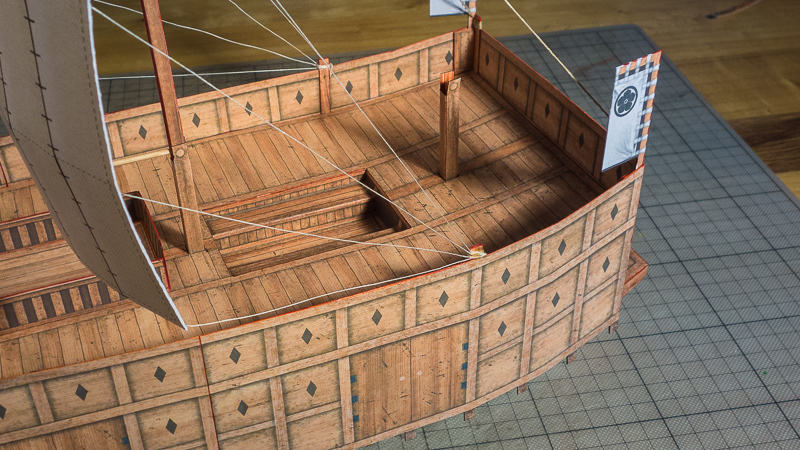 The mast is not raised and the sails are stowed somewhere under deck. 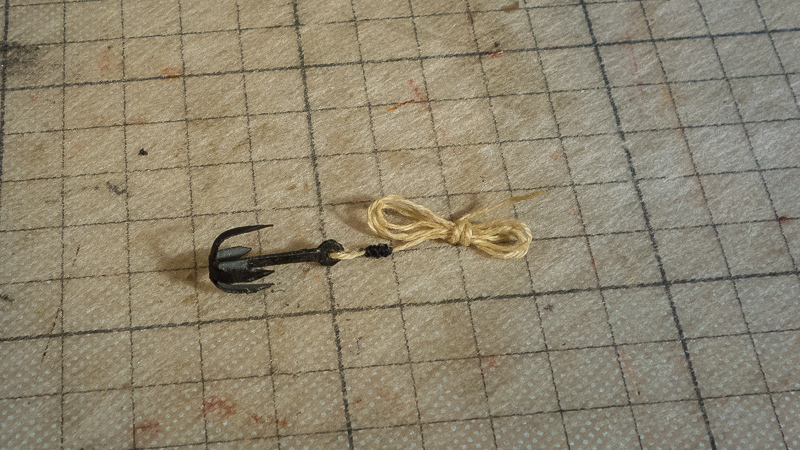 I also made a couple of grappling hooks that are just placed on the bow deck without ropes. 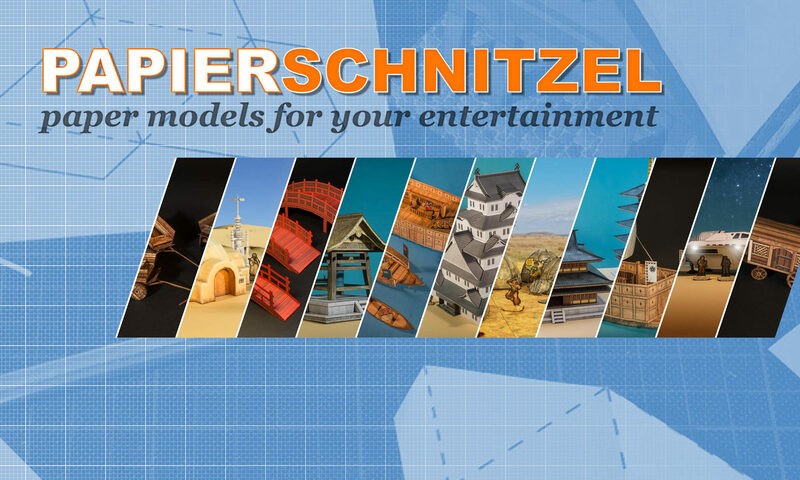 After spending some time researching how the rig would look like I was ready to start. The first thing I did was raid our sowing box for usable material … and I was lucky! I found all I needed. The sand color thread was thick enough and had just the right color to emulate ropes. The black thin thread I would use to tie off rope ends. And the white one I needed for the ropes that positioned the sail. The next step was to raise the mast. For that I inserted a short piece of strong cardboard to help it position at the right height. 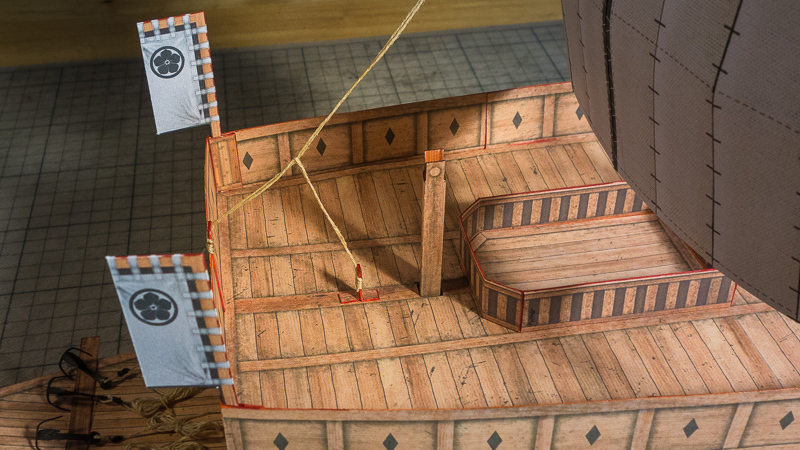 Then I added some posts made out of textured parts I reprinted for this purpose at the back, sides and front where I wanted to “tie” the ropes holding the mast. These are the back ones in the corners. 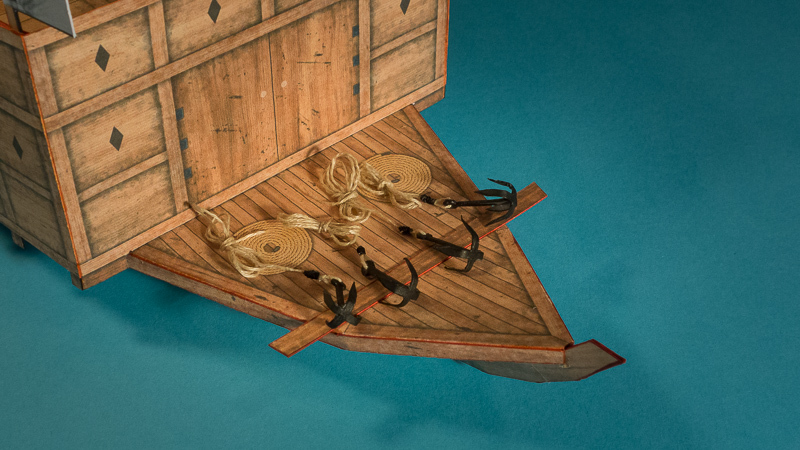 And finally the ones on the side where the sail positioning ropes would go. 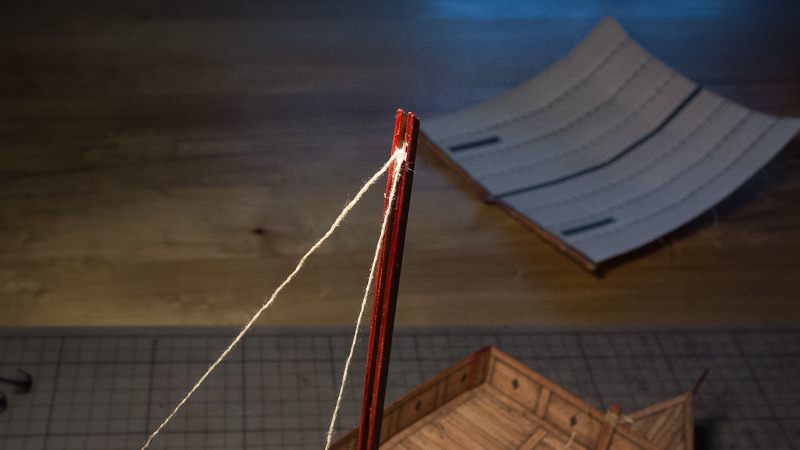 I then started putting some white glue on the back post and wrapped the “rope” thread around a couple of times. I did the same for the front middle one. 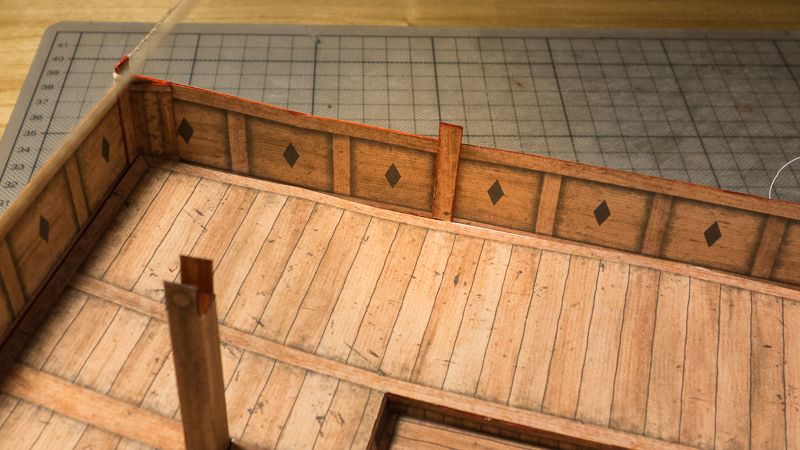 Then I glued the two back lines to the top of the mast. 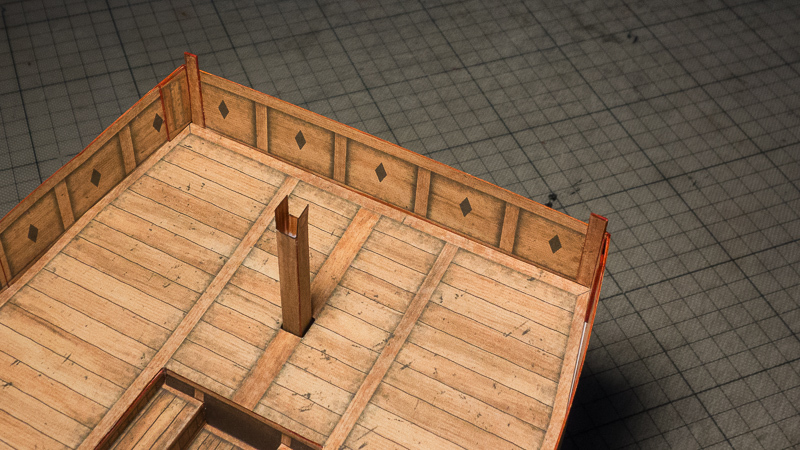 Due to the split construction of the mast, I just glued them into the middle space. 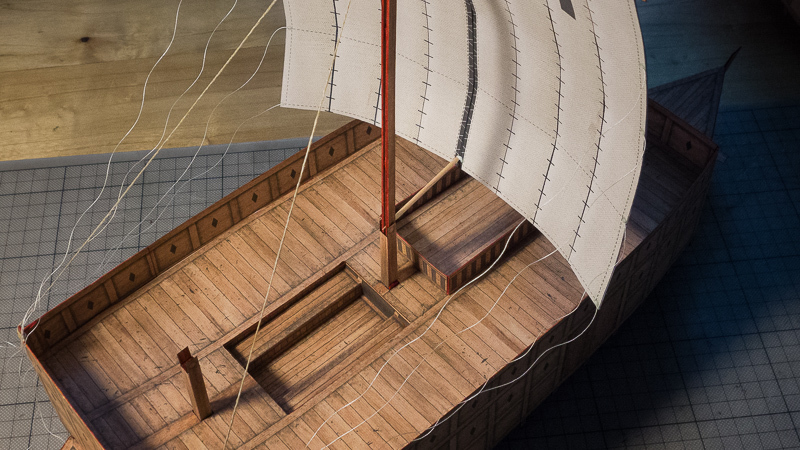 Then I would have to add the sail as the front mast rope would go over the sail. 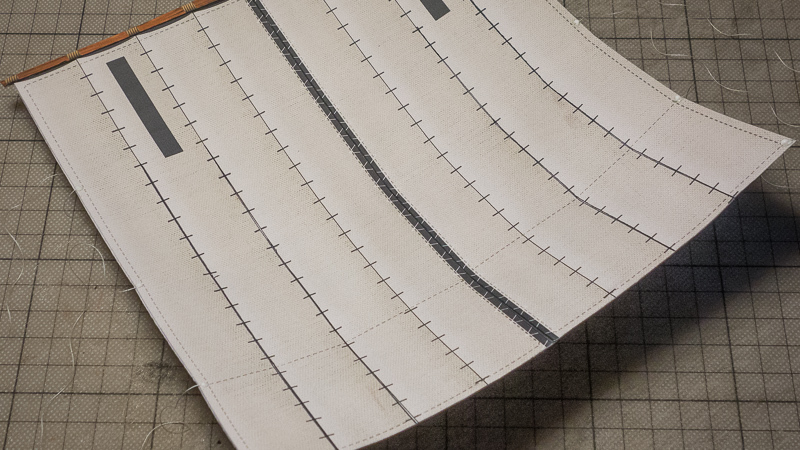 I added the white “ropes” to the sides of the sail by gluing them into position with little drops of glue. 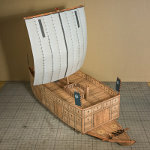 Once dry I placed the sail onto the mast. 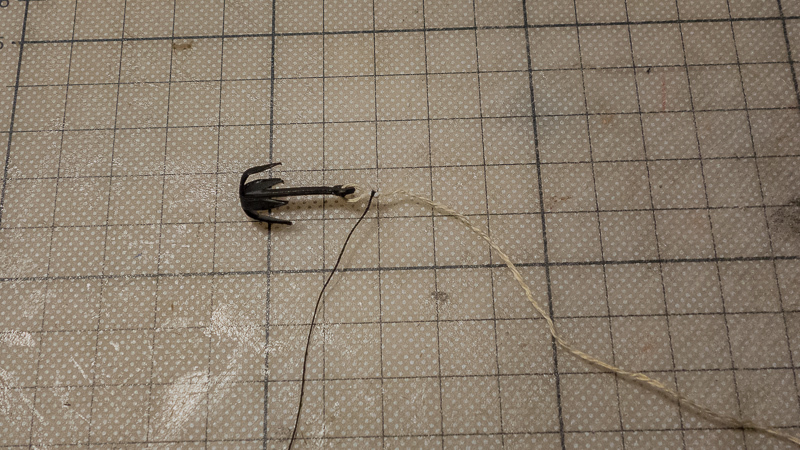 Then I was able to glue the front rope thread into position. 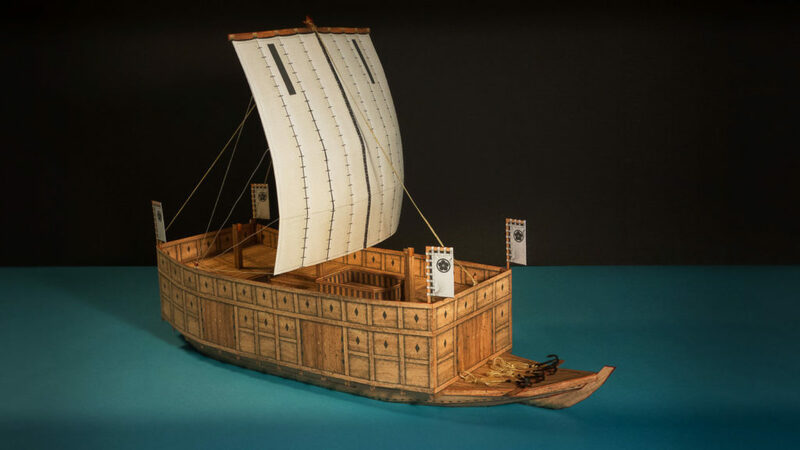 To help the sail stay in the right position, as if the wind was blowing it towards the bow, I added a toothpick cut to the right length and positioned as shown. You can also see the white ropes lay into the corners as I did not have the side posts added in that picture. 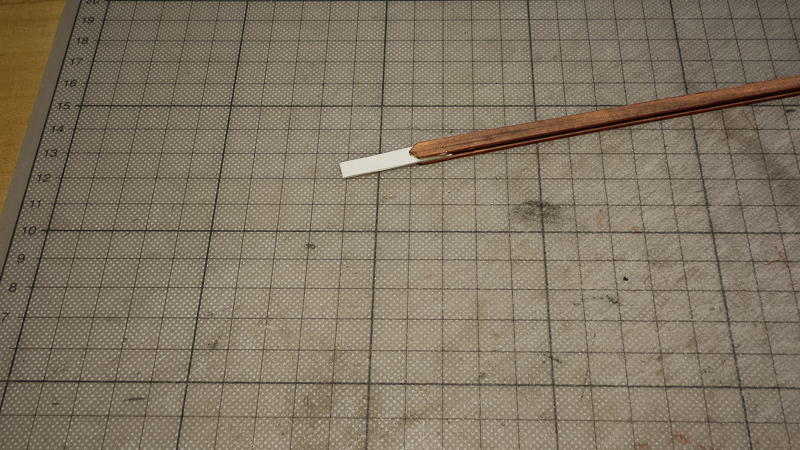 Once I had the side posts added, I put some glue on them and carefully wrapped the white threads around. 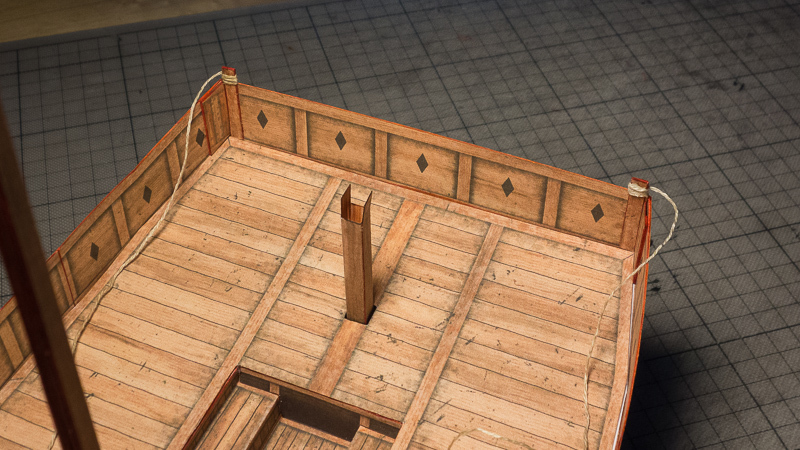 I then saw in my research that the front rope had a special connection, so I added this little part to the front deck section and again in the same process added this rope to it. When it was dry I placed it into position. 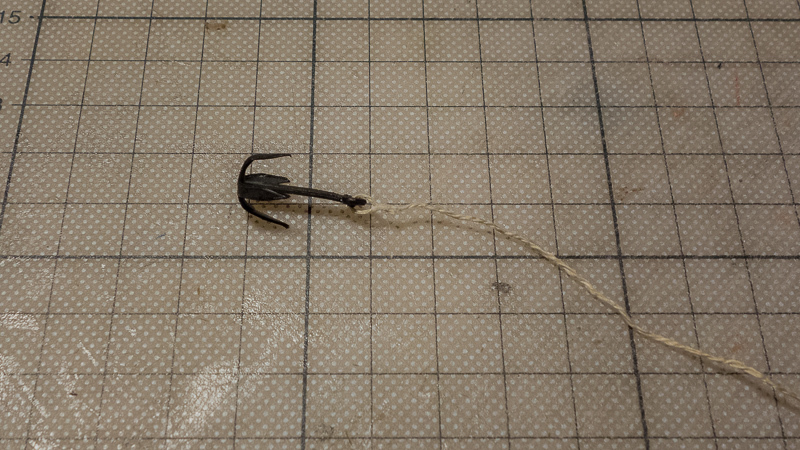 For the grappling hooks, I threaded the rope through the ring and glued the rope forming a loop back and glued it in position. I then carefully glued some black thread to the loop end. 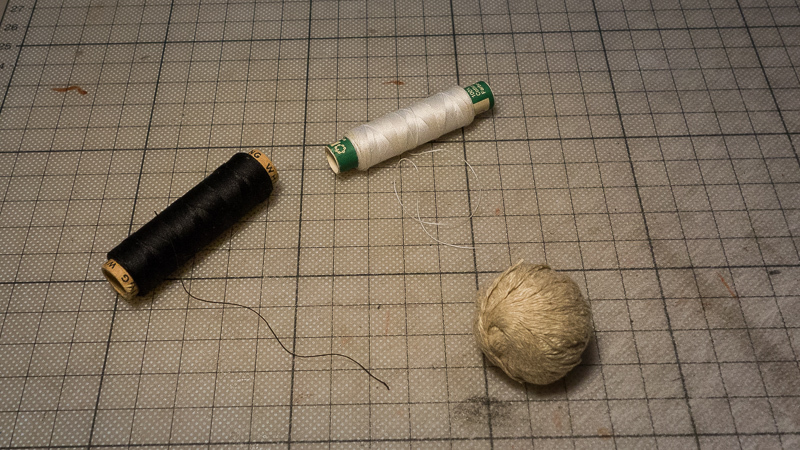 Once it dried I then put some glue on the rope and wound the black one around a couple of times. 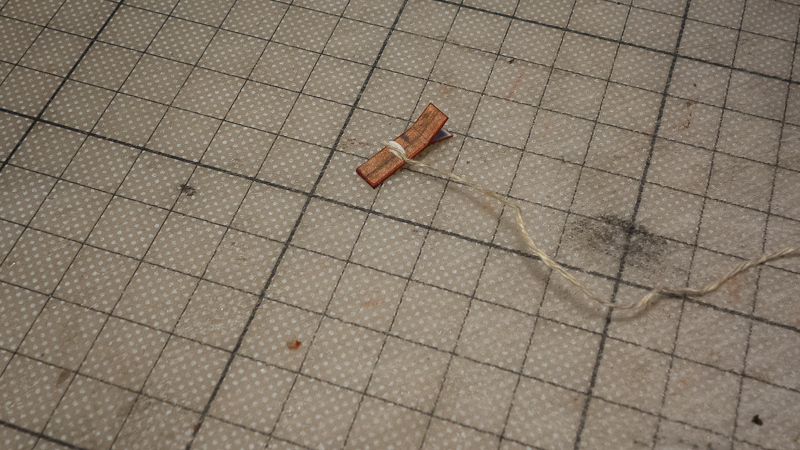 I then formed a coil of rope and also glued it together like this. 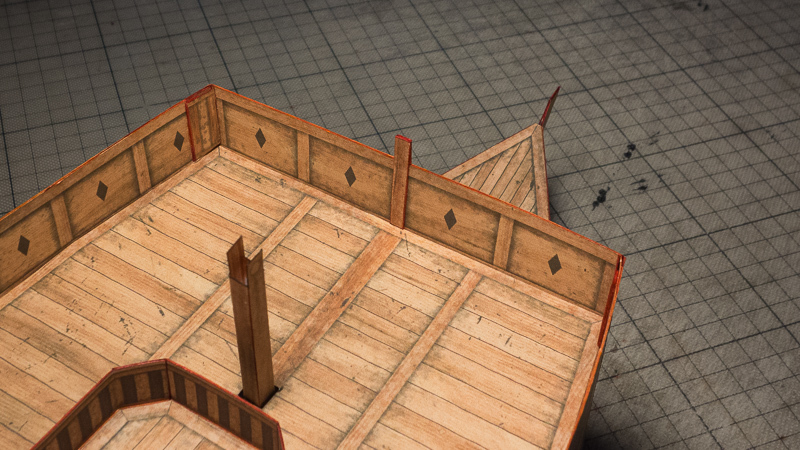 I repeated these steps for the remaining grappling hooks and then placed them onto the bow deck!